Misserfolge und Misserfolgsstory... Marx, Robert E.
The demand for tooth-colored restorations has grown considerable in western countries during the past decade. In addition, ecological considerations and patients' concern about amalgam fillings as a risk for their health are increasing. Today, composites and ceramics are alternative clinical restoration materials. 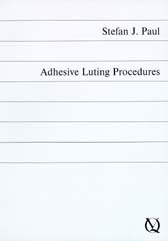 For esthetic reasons, transparent composite luting resins are used for the cementation of ceramic restorations onto teeth. However, the primary goal of every cementation procedure is to obtain a durable bond and a good marginal adaption of the luting material to the restoration and the tooth.